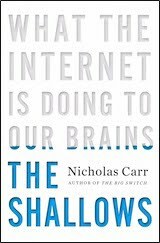 I'm looking forward to reading Nicholas Carr's book, The Shallows: What the Internet Is Doing to Our Brains . His essay "Is Google Making Us Stupid?" was much discussed around here. Check out reviews by Jonah Lehrer and Russell Arben Fox. More from the New York Times on how technology and gadgets are rewiring our brains. Re the quote Russell noted: I have always read like that, even before the web. I’ve never read word by word, except when I do close reading as part of being a English professor. I’m disinclined, therefore, to think it a “bad” way of reading. Russell Crowe and Megan Fox are reviewing books now? Laura, thanks for the link. It’s a very good book, I think. And given the quote you pulled, I assume you also saw that, on the basis of the minimal number-crunching I did, your writing is the most adapted to the realities of internet reading out of all the bloggers on my blogroll. So hey–my ill-concealed envy of your mastery of the medium now has a statistical basis! Wendy, it’s true that Carr occasionally veers over into taking an apocalyptic tone in his book (a tone which I personally don’t mind, as I agree with a lot of it). But for the most part, he’s not talking about reading disappearing, or anything like that; he’s just talking about a change. For example, it seems likely that the majority of people, from the beginning of the mass production of print until today, have been skimmers; that’s not the issue. The issue–the change he thinks is bad–is that a lot of internet reading contributes to making it harder for our brains to move out of skimming mode, even if we think we want to; we are, he claims, becoming used to reading everything, from news to novels, in a state of perpetual distractedness. MH, assuming the comment about Crow and Fox are a reference to my family, my deepest thanks for comparing me to Mr. Crowe. My wife loves all sorts of British dramas; telling her that I’ve been compared to Captain Jack Aubrey will do wonders for our relationship. My daughter Megan, however, loathes being associated, even humorously or mistakenly, with the actress. She actually once had to counsel her FB account because he was getting so much junk from adolescent boys asking her for naked photos. Having read only the New York Times piece, all I can say is that people develop these habits because they are adaptive. I am a very focused person and am often called upon to handle focus-intensive tasks, such as final review of documents, project planning, and data analysis. As happy as my colleagues are to pass these tasks off to me, they do not appreciate the flip side that comes with my level of focus: I do not handle interruptions well, for example, and the quality of my work significantly degrades as I get tired in the afternoons. Hate to say it, but people will often look past what they perceive as the fairly common trait of not catching every detail. They are less forgiving about someone who resists interruption (in the form, for example, of refusing an ad hoc meeting). RAF, I had no idea of your daughter’s name. Ah, but you might think this because your better at one skill than the other. I’m the very last person you want to have do final review on a project. I’m aware of my handicap, and do what I can to work around it, but I haven’t found folks to be particularly forgiving on the subject. I’m going to follow up on the NY times article on distraction. It seemed reasonably balanced (the cites to Bavalier’s work, that shows some positive effects of video game playing, for example, in addition to the complaints about distraction). I think it’s *possible* that we’ve accidentally structured our environment in a way that decreases our efficiency. But, I also think that many of the studies that show that “multi-taskers” do poorly at atentional tasks could just be showing that multi-taskers are unfocused to start with. They listen to music/take email breaks/surf the web because they are distractable. Those things don’t *make* them distractable. But, I need to read the studies to unpack that possibility. See, I only absorded 18% of the post and it had the names “Russell” and “Fox” in it. Boy, I can imagine that your daughter is driven crazy by her name.